Helsinki, or Stadi, as we locals call the capital city of Finland, is home to almost 600 000 people. That’s not much if you think of other capitals of the World, but it’s still the biggest city in Finland. The capital area consists of four cities (Helsinki, Espoo, Vantaa and Kauniainen), and some 1.3 million people live there. That’s quite a lot, since Finland only has about 5.3 million people. Helsinki was founded in 1550 by the King of Sweden, but no buildings from that time have survived. Oldest buildings in Helsinki date to the 18th century and can be found near the Senate Square right downtown. Around the same square you’ll find nice examples of neo-classical architecture. 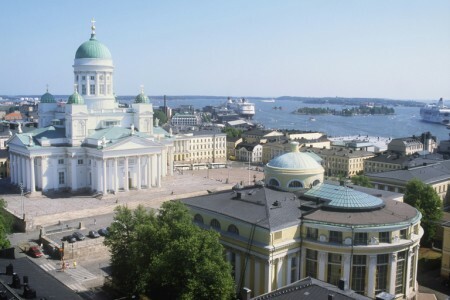 The Helsinki Cathedral is one of the landmarks of the Finnish capital. Today Helsinki is a modern European city that evolves constantly. New buildings are being built, and old ones conserved, so that the history of Helsinki always stays present. Here and there, you can find marks of the Russian Empire and the Swedish Kingdom, because Finland used to be part of first Sweden and then Russia before gaining independence in 1917. New buildings aren’t that bad either: check out the wild lines of the Museum of Contemporary Art Kiasma, or the upcoming new library in Kaisaniemi (still under construction). A shredder down by the Töölö Bay at 3 am. Photo by Justin Sexton. Helsinki is a super nice city in the summer. 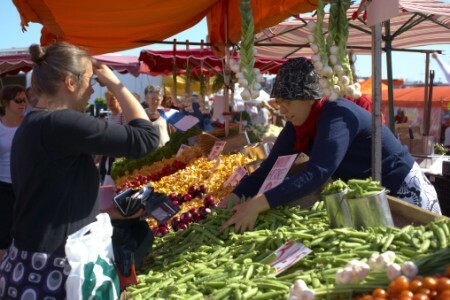 The city wakes up, the grass is green, flowers bloom and people smile – that’s not the case in the wintertime! You can just stroll around the city, maybe have a cup of coffee somewhere, a scoop of ice cream at a park, and maybe a pint of beer on the bar terrace. Or gather your friends for a shred session at the Töölö Bay, or put up your net in the Kaivopuisto park. In the summertime the sun doesn’t really set at all. It’s light when you wake up, it’s light when you go to bed, and it’s light even in the wee hours when you go home from a club! A great place to spend a nice summer day is Suomenlinna, a maritime fortress built in the 18th century on the islands off Helsinki. There you’ll find lots of history, soft grass for napping or a picnic, and a really nice atmosphere. Take the HSL ferry from the Market Square, and enjoy the sea breeze on the way. If you like swimming or sunbathing, head to the Hietaranta beach or the Olympic Swimming Pool, which is close to the tournament site. One way to see Helsinki is getting on a sightseeing boat from the Market Square. The boat takes you on a tour around the archipelago, giving you a different view of Helsinki. Highly recommended, especially on a sunny day! There is also an amusement park in Helsinki called Linnanmäki. Entrance is free, but tickets to rides are quite expensive. However, the old wooden rollercoaster is really something. Not the wildest ride, but it definitely has character! The liveliest district of Helsinki is Kallio. Historically it has been home of the working class, boozers, hustlers and junkies, but today it’s taken over by artists and hipsters. Kallio still has high unemployment and alcoholism rates, but its reputation has become a lot better in recent years. Apartments have become ridiculously expensive, but the original atmosphere is still present. There are lots of cheap shabby bars, pizzakebabs and other small restaurants, arts and boutiques, so take a tram and explore the streets of Kallio! 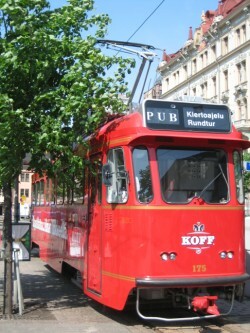 One of the greatest things in Helsinki is the easy, versatile and safe public transportation. It takes you to where ever you want by buses, trams, metro, trains and even ferries. Check out the prices at HSL. And Journey Planner is really handy when figuring out which bus or tram to take. Save legs, take tram. 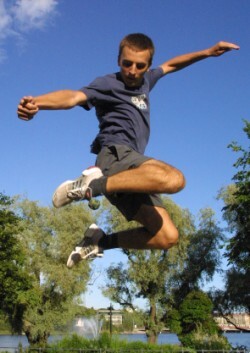 Photo by Pöllö. Some rights reserved. Another great thing are the distances. The city center isn’t really big, so you can basically walk anywhere. Or take a tram if you want to save your legs for the afternoon shred! Our tournament site, Töölö Sports Hall, is located quite close to city centre. It’s only about 15 minute walk or a couple stops by tram. If you feel like shopping, check out Kamppi and Forum shopping centers and Stockmann department store in downtown Helsinki. By metro you can get yourself to east Helsinki to Itäkeskus shopping centre. But don’t count on any finding bargains in here; things are usually more expensive in Finland than, ummm, practically anywhere else! For local stuff and brands check out We Are Helsinki and Design district. Yes, Finland is expensive, so you probably need to break into your piggybank before taking off! How about the Finnish language? It’s said to be one of the most difficult languages in the world. If you really want to learn Finnish, check this. And I’m 99% sure that the first time you’ll have a beer with a Finn, he’ll teach you all the bad words in Finnish! In Helsinki there is also a vivid slang living underground. Stadin slangi has been evolving for more than a century getting influences from Swedish, Russian and nowadays also English languages. Some old school geezers speak so weird slang it’s difficult to understand if you only know modern slang! The slang is an essential part of Helsinki, and you can even use the Journey Planner in Slangi. Finnish cuisine isn’t very famous internationally, but you’ll find good Finnish food in the Market Square. Try some smoked salmon on a rye bread, or have a dozen or two fried vendaces (muikku) and potato mash for lunch. Another great place for local delicacies is the Hakaniemi Market Hall, or just ask a Finn what’s good and truly Finnish. For a snack you can grab a traditional carelian pie from any grocery store. Made of rye and rice porridge, it gives you energy for those long net sessions and tripless runs. Of course hamburgers, pizzas, kebabs and other stuff is widely available, but be sure to try out Finnish dishes as well. Eat.fi is a great service for finding restaurants. Oh yeah, and reindeer meat is really tasty. Shopping at the Market Square. Photo by Ewan Bell. Finland is really safe country for tourists. Don’t act stupid and you’ll be just fine. So, keep your valuables safe, check that nobody sees your pin-code at ATM or stores, don’t take illegal ”dark taxis”, don’t walk alone in downtown, Kaisaniemi park or Kallio district at night, don’t break the law, don’t give the finger to guys twice as big as you, you know how it goes. If something should happen, the emergency number is 112. Welcome to Helsinki! Feel free to ask if you need more information about Finland or Helsinki! There are 1 Comments to "Helsinki"
How cool is this google map feature !? !